This adorable raccoon animal with his mask across his eyes is his trademark. He is foraging in the dry leaves for food. The raccoon is seen near the shores of George Lake. The brown dry leaves carpet the forest floor. Cute Raccoon, Procyon lotor, foraging in the dry leaves on the shores of George Lake, Killarney Provincial Park, Ontario, Canada. 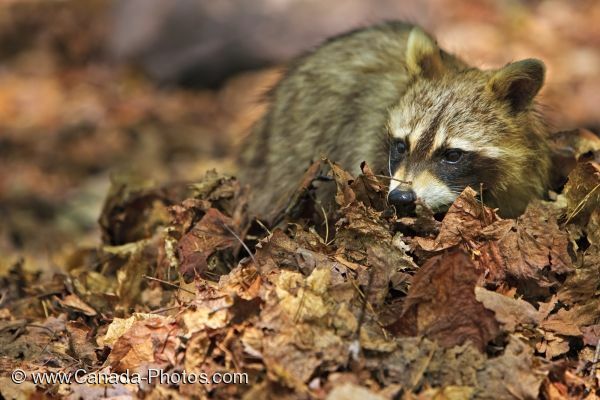 This adorable raccoon with his trademark mask explores the dry leaves in Killarney Provincial Park.